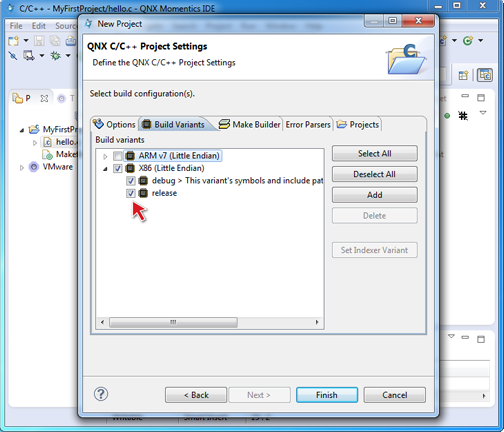 From the workbench main menu, select File > New > QNX C (or C++) Project . 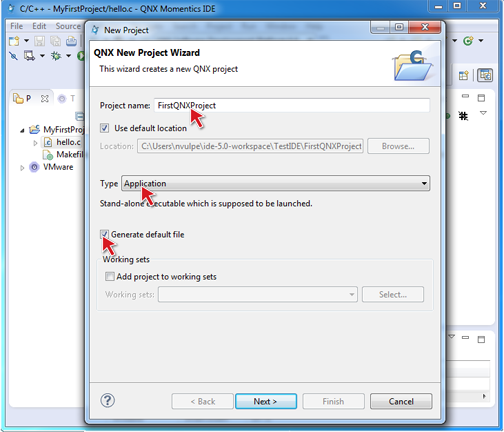 The QNX New Project wizard appears. Name your project, then select the type (e.g. Application). On the Build Variants tab, expand the build variant that matches your target type, such as X86 (Little Endian), then select the appropriate build version (release or debug—see "Building an executable for debugging" for more information). 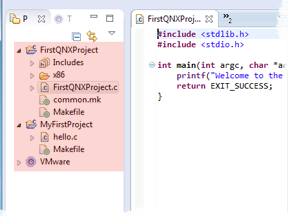 The IDE creates your QNX project and shows the source file in the editor. Congratulations! You've just created your first QNX project. For instructions about building your program, see the section "Building projects". Note: In order to run your program, you must first set up a QNX Neutrino target system. For details, see "Preparing Your Target".